I’m a dip junky, I must admit. 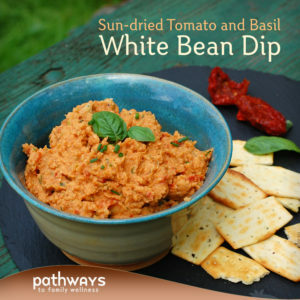 I love hummus and bean dips of all kind. 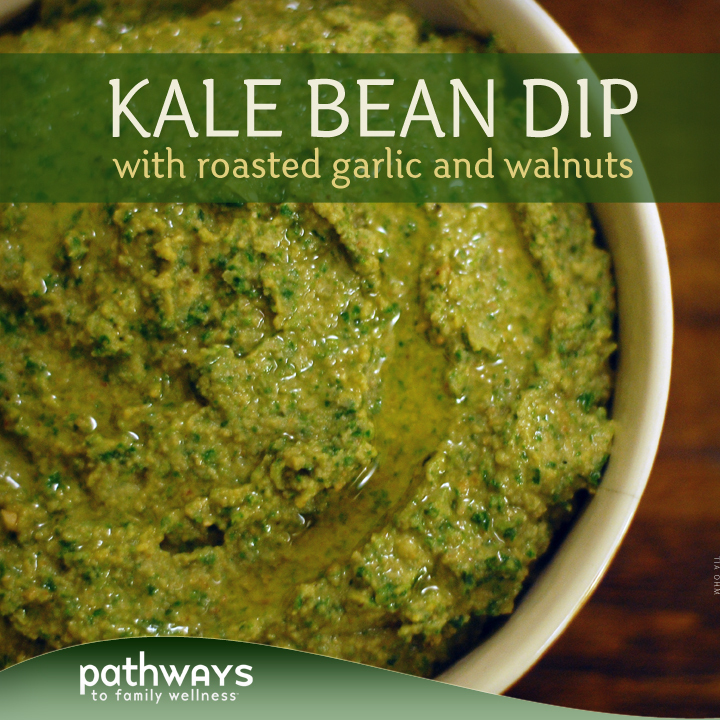 Heck, blend up some vegetables and I’ll dip a chip in it (we actually tried that, and it was good!). They are a great way to get in some protein when you need a quick snack come mid-day. 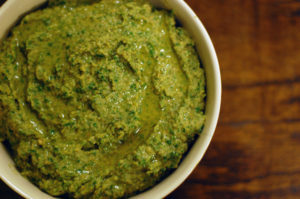 I have put sweet potatoes, beets, tomatoes, zucchini, eggplant (and others) in dips, but it never occurred to me to use a a green leafy vegetable. What have I been doing all this time!? 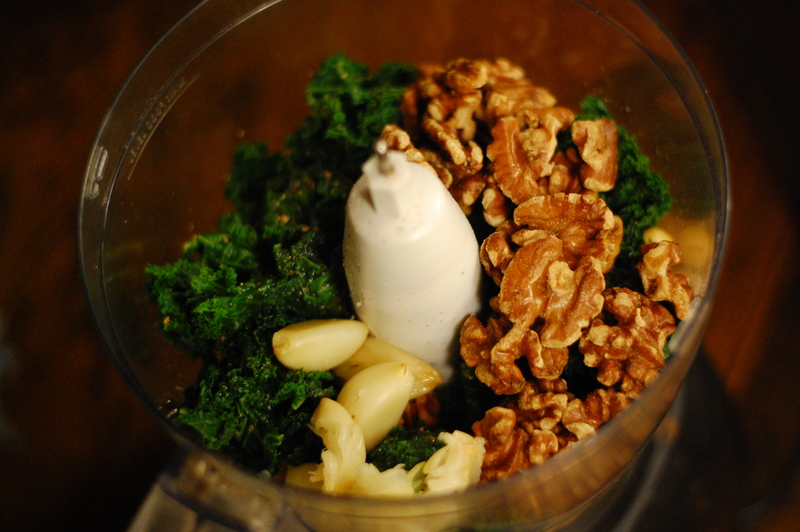 I blanched the kale here, because raw kale is just too porous and is harder to digest, especially in winter when our bodies are craving warm, cooked meals. 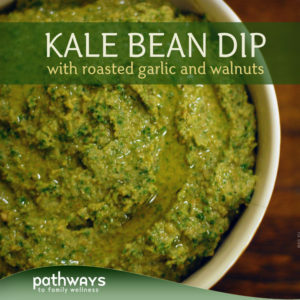 With added roasted garlic and walnuts, this dip is a warming winter favorite (psst: try serving it fresh and slightly warm; it’s lovely). Don’t have walnuts? You could use tahini, or better yet, try roasting some other nut and throwing it in. ‘Cause why not? Just dipping some chips or veggies in it and I’m usually good to go, but this time I actually had it on top some sauteed veggies and it was delightfully satisfying. 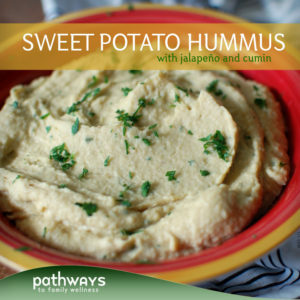 It would be great as a spread on pita, homemade toast, or in a wrap as well. 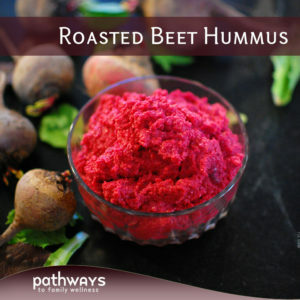 However you have it, this is a new take on the common hummus dip, and proves to be a great way to add some nutrient rich vegetables to your day. Preheat oven to 350°, and bring about 4 cups water to a boil over a small pot. When oven is preheated, wrap your bulb of garlic in tin foil and roast for about 20 minutes. Add your walnuts to a small baking sheet and roast for about 10 minutes. Meanwhile, when your small pot of water begins to boil, add your kale and blanch in boiling water for a few minutes or until slightly wilted and vibrant green. Drain, let cool, and squeeze lightly to drain out some of the juice, but not all. In a food processor, combine garbanzo beans, blanched kale, roasted walnuts and garlic, olive oil, lemon juice, sprig of parsley, sea salt and black pepper. Blend until smooth. 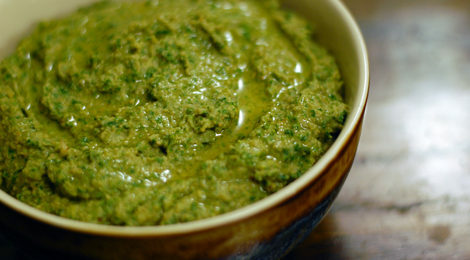 Serve slightly warm if desired, or refrigerate and serve cool.